NAC domain transcription factors initiate secondary cell wall biosynthesis in Arabidopsis fibres and vessels by activating numerous transcriptional regulators and biosynthetic genes. NAC family member SND2 is an indirect target of a principal regulator of fibre secondary cell wall formation, SND1. A previous study showed that overexpression of SND2 produced a fibre cell-specific increase in secondary cell wall thickness in Arabidopsis stems, and that the protein was able to transactivate the cellulose synthase8 (CesA8) promoter. However, the full repertoire of genes regulated by SND2 is unknown, and the effect of its overexpression on cell wall chemistry remains unexplored. We overexpressed SND2 in Arabidopsis and analyzed homozygous lines with regards to stem chemistry, biomass and fibre secondary cell wall thickness. A line showing upregulation of CesA8 was selected for transcriptome-wide gene expression profiling. We found evidence for upregulation of biosynthetic genes associated with cellulose, xylan, mannan and lignin polymerization in this line, in agreement with significant co-expression of these genes with native SND2 transcripts according to public microarray repositories. Only minor alterations in cell wall chemistry were detected. Transcription factor MYB103, in addition to SND1, was upregulated in SND2-overexpressing plants, and we detected upregulation of genes encoding components of a signal transduction machinery recently proposed to initiate secondary cell wall formation. Several homozygous T4 and hemizygous T1 transgenic lines with pronounced SND2 overexpression levels revealed a negative impact on fibre wall deposition, which may be indirectly attributable to excessive overexpression rather than co-suppression. Conversely, overexpression of SND2 in Eucalyptus stems led to increased fibre cross-sectional cell area. This study supports a function for SND2 in the regulation of cellulose and hemicellulose biosynthetic genes in addition of those involved in lignin polymerization and signalling. SND2 seems to occupy a subordinate but central tier in the secondary cell wall transcriptional network. Our results reveal phenotypic differences in the effect of SND2 overexpression between woody and herbaceous stems and emphasize the importance of expression thresholds in transcription factor studies. Plant fibres constitute a valuable renewable resource for pulp, paper and bioenergy production . In angiosperms, the two principle sclerenchyma cell types that comprise secondary xylem are xylem vessels, which facilitate the transport of water, and xylary fibres, which provide mechanical strength and which make up the bulk of woody biomass . Wood density and chemical composition, fibre and vessel length, diameter and wall thickness, and even the proportion of axial and radial parenchyma heavily influence pulp yield, digestibility and quality, although the relative importance of each varies from species to species [3, 4]. During xylogenesis in angiosperms, fibres differentiate from the vascular cambium, elongate, and deposit a lignified secondary cell wall (SCW). SCW formation is associated with a distinct form of programmed cell death [5, 6]. Much research has been devoted to the biosynthesis of SCW biopolymers, namely (in decreasing order of abundance) cellulose [7, 8], hemicellulose  and lignin [10, 11]. Complementing this, in the past six years much of the transcriptional network underlying SCW biosynthesis has been deciphered, mainly exploiting Arabidopsis thaliana and the Zinnia elegans mesophyll-to-tracheary element in vitro transdifferentiation system [12, 13]. Genes involved in secondary xylem formation are regulated principally at the transcriptional level, accentuating the central significance of the SCW transcriptional network . Manipulation of transcription factors (TFs) associated with the network presents the potential to enhance fibre properties through altering the regulation of a large number of biosynthetic genes. Kubo et al. first identified NAC domain TFs VASCULAR-RELATED NAC-DOMAIN7 (VND7) and VND6 as "master activators" of SCW formation in proto- and metaxylem vessels, respectively. It was later shown that VND6 and VND7 are functionally redundant, being sufficient for all vessel SCW formation [16, 17]. In xylem fibres, a similar transcriptional master switch was identified. NAC family proteins SECONDARY WALL-ASSOCIATED NAC DOMAIN1 (SND1) and NAC SECONDARY WALL THICKENING PROMOTING FACTOR1 (NST1) redundantly activate Arabidopsis fibre (and, to some extent, silique valve) SCW formation [18–22]. In other cell types with secondary walls, such as the endothecium of anthers, NST1 was also found to activate SCW development, in this case redundantly with NST2 . Together, these studies support a role for NAC TFs as principal activators of SCW formation in fibres and vessels, acting in distinct combinations in each case. Several studies suggest that SND1, NST1, VND6 and VND7 activate a conserved, cascading transcriptional network featuring, but by no means limited to, various NAC, MYB and homeodomain TFs (reviewed in [13, 24]). SND1, NST1, NST2, VND6 and VND7 regulate an overlapping set of targets [21, 25], supported by the ability of NST2, VND6 and VND7 to complement the snd1 nst1 double mutant when ectopically expressed in fibre cells [26, 27]. For this reason, they have been collectively referred to as secondary wall NACs (SWNs) . Amongst the downstream targets of SWNs, SND3 and MYB103 are directly activated by SND1/NST1 and VND6/VND7 [21, 25–27], although SND3 has not consistently been detected as a VND6/VND7 direct target. SND2 is indirectly regulated by SND1/NST1 [21, 28], but there exists no evidence for regulation by VND6/VND7. Loss- and gain-of-function mutagenesis of SND2, but interestingly also that of SND3 and MYB103, produced a fibre-specific phenotype . Whilst dominant repression  drastically reduced fibre-specific SCW thickness, individual overexpression of MYB103, SND2 and SND3 increased SCW thickness in interfascicular and xylary fibres, with no apparent impact on vessels. In stems a reduction in glucose, xylose and mannose cell wall sugars occurred during dominant repression of MYB103, SND2 or SND3. Conversely, all three TFs could transactivate the SCW cellulose-associated CesA8 gene promoter, but not representatives of hemicellulose (IRX9) or lignin (4CL1) biosynthesis . The regulation and function of SND2 may differ in herbaceous and woody plants, especially in woody tissues which possess greater proportions of fibre cells than stems of herbaceous plants. This may be facilitated by gene family expansion and specialization in woody plants . As many as four putative SND2 orthologs exist in poplar due to significant expansion of the NAC family , some paralogs of which may have undergone subfunctionalization in Populus . All four putative orthologs were found to be preferentially expressed in developing xylem and phloem fibres . Overexpression of one of the putative orthologs, PopNAC154, resulted in a decrease in height and an increase in the proportion of bark to xylem in poplar trees, with no perceptible effect on SCW thickness . This apparent conflict with the SND2 overexpression phenotype in Arabidopsis  illustrates that the regulatory function of SND2 homologs may differ between herbaceous and woody plants. The observation that SND2 overexpression led to enhanced SCW formation in Arabidopsis fibres and that it potentially regulates cellulosic genes are important findings, because evidence supports the existence of a similar transcriptional network regulating fibre SCW development in angiosperm trees [13, 33, 34]. However, several aspects of the biological function of SND2 remain to be resolved before the biotechnological potential of the gene can be determined. The global targets of SND2 have not been identified and its position in the transcriptional network has not been established. The finding that SND2 regulates cellulose, but not xylan and lignin biosynthetic genes, was based on a single representative gene from each pathway . 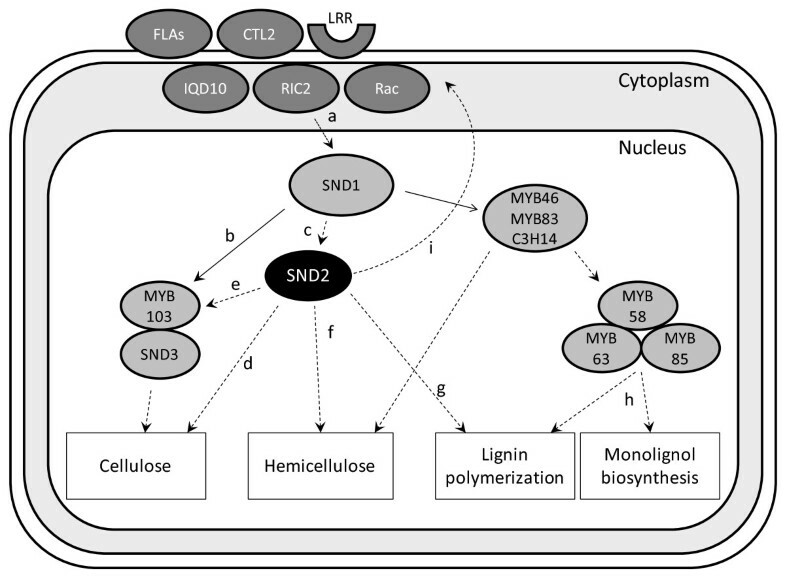 A greater knowledge of SND2 targets is required to confidently negate its regulation of hemicellulose and lignin biosynthesis. It is also unclear from the analysis by Zhong et al. whether SND2 overexpression invariably leads to increased fibre SCW thickness, both in Arabidopsis and in woody taxa. Finally, the effect of SND2 overexpression on cell wall chemistry has not yet been reported. 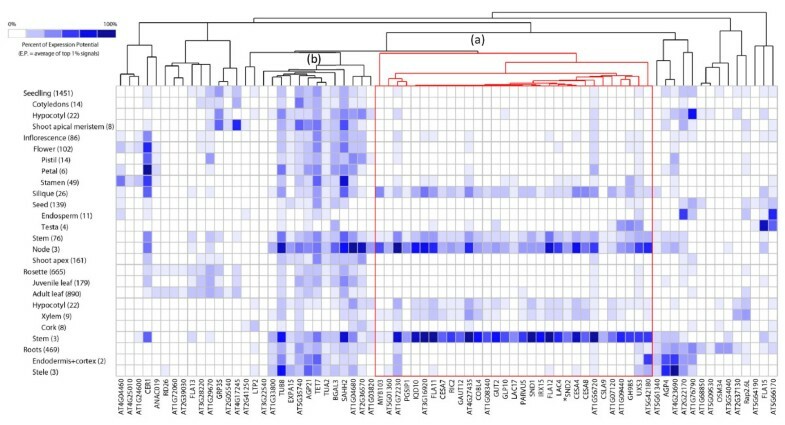 We aimed to further characterize the position and regulatory role of SND2 in the fibre SCW transcriptional network, and confirm the phenotypic effects of SND2 overexpression in Arabidopsis and Eucalyptus plants. Our objectives were to identify genes that are differentially expressed in SND2-overexpressing plants, and determine the overall effect on Arabidopsis development and biomass production, as well as fibre SCW formation in Arabidopsis and Eucalyptus. We describe novel regulatory roles for SND2 in fibre SCW development, and propose a model for the role of SND2 in the transcriptional network regulating SCW formation. SND2 was previously shown to transactivate the CesA8 gene promoter in Arabidopsis protoplasts . In order to identify other genes regulated by SND2 in planta, we overexpressed SND2 in Arabidopsis plants by cloning the SND2 coding sequence into the overexpression vector pMDC32 . We introduced the construct into A. thaliana Col-0 plants and randomly selected three homozygous T4 lines (A, B, and C), from a pool of T1 transgenic plants herein denoted "SND2-OV". We confirmed that SND2 was strongly upregulated in the T4 SND2-OV lines using RT-qPCR analysis (Additional file 1, Figure S1). We then tested the T4 SND2-OV lines for preliminary evidence of CesA8 upregulation in lower inflorescence stems using RT-qPCR analysis. Interestingly, line A ("SND2-OV(A)") exclusively showed evidence for CesA8 upregulation (not shown), and was therefore selected for transcriptome analysis. In order to determine which genes were differentially expressed as a result of SND2 overexpression in Arabidopsis stems, the transcriptome of SND2-OV(A) plants was compared to that of the wild type with respect to the bottom 100 mm of primary inflorescence stems. High quality total RNA (RQI > 9.3) was isolated from three biological replicates of eight-week-old wild type and SND2-OV(A) plant stems, and labelled cDNA hybridized to Agilent 4 × 44k Arabidopsis transcriptome arrays. Significantly differentially expressed genes (DEG) were identified as those with an experiment-wise false discovery rate below 0.05 and fold change > |±1.5|. This analysis identified a total of 155 upregulated and 68 downregulated genes in SND2-OV(A) relative to the wild type (Additional file 2). In order to identify overrepresented gene ontology (GO) classes amongst the DEGs, the GOToolBox resource  was interrogated with a hypergeometric test (Benjamini and Hochberg correction) using The Arabidopsis Information Resource  annotation set. Significantly enriched biological processes (P < 0.01) revealed a predominant role of the DEGs in (secondary) cell wall organization and biogenesis, carbohydrate metabolism, signalling and response to stimulus (Additional file 3, Table S1). SND2 is preferentially expressed in xylem [21, 38]. We hypothesized that targets of SND2 would be co-expressed with endogenous SND2 transcripts. The tissue-specific expression of DEGs identified in SND2-OV(A) (fold change > |±1.5|) was explored by observing the expression patterns across selected Arabidopsis tissues using the Genevestigator V3  anatomy clustering tool. At the time of analysis, the Genevestigator database totalled 374 publicly available microarray studies for Arabidopsis, encompassing 6290 samples. Of 223 genes in our SND2-OV(A) dataset, 190 were represented by unique probe sets on high quality ATH1 22k arrays. We examined the endogenous expression of these genes across 26 tissues based on results from 4422 arrays, and subjected the genes to hierarchical clustering according to their absolute expression profiles. The majority of genes did not conform to a single expression pattern, with only ~9% of the genes displaying expression profiles clearly resembling that of native SND2 transcript, i.e. with preferential expression in SCW-containing tissues (Additional file 1, Figure S2). Thus, the majority of genes differentially expressed as a result of SND2 overexpression were not generally associated with SCW-containing tissues. Novel targets arising from ectopic overexpression of cell wall-associated NAC TFs have been reported previously . It is possible that a similar phenomenon occurred in our study, since the bulk of the sampled transgenic stems comprised tissues where SND2 is not naturally expressed. This may explain the small proportion of DEGs that were co-expressed with SND2 in Additional file 1, Figure S2. To avoid this possibility, we stringently defined the putative authentic targets of SND2 as those that were also a subset of SND1-regulated genes, the latter identified by microarray analysis of SND1-overexpressing Arabidopsis plants by Ko et al. . The age of the plants in the cited study (~8.5 weeks) and the tissue sampled (lower 50 mm of the inflorescence stem) was similar to our experiment. SND2, a known indirect target of SND1 , was the most strongly upregulated TF in the SND1-overexpressing plant stems , further justifying our approach. We extracted genes common to the Ko et al. data and our significant SND2-OV(A) microarray data, without fold-change filtering. Seventy five genes were shared between the two datasets, herein denoted "SND2∩Ko", ~79% of which were regulated in a consistent direction (Table 1). Amongst them, genes involved in transcription, (secondary) cell wall biosynthesis, cell wall expansion and modification, carbohydrate metabolism, stress response and proteins of unknown function were prominent (Table 1). There was notably no differential expression of monolignol biosynthetic genes. Subset of SND1-regulated genes  also significantly differentially expressed in stems of eight-week-old SND2-OV(A) plants relative to wild type (SND2∩Ko). bGenes are categorized by Gene Ontology classification according to The Arabidopsis Information Resource www.arabidopsis.org, unless otherwise described in the main text. We independently assessed the possible function of SND2 by identifying genes co-expressed with native SND2 transcript from the AtGenExpress Plus Extended Tissue Set public microarray data using Expression Angler , employing a stringent Pearson correlation coefficient threshold (R > 0.90). Genes associated with SCW biosynthesis (e.g. secondary wall CesAs, IRX genes) as well as TFs previously implicated in SCW regulation (MYB103, SND1), were amongst the 31 genes found to be co-expressed with SND2 (Table 2), supporting a role of SND2 in SCW regulation. 22 of the genes were differentially expressed in the SND2∩Ko data (Table 2). Genes tightly co-expressed with endogenous SND2 transcript. Expression Angler  was used to find co-expressed genes in the AtGenExpress Plus Extended Tissue Set microarray data. The R-value represents the Pearson correlation coefficient of co-expression, set to a threshold of R > 0.90. Co-expressed genes that were also differentially expressed in the SND2∩Ko subset of SND2 overexpression data (Table 1) are indicated in the far right column. The seventy five SND2∩Ko genes represented on the ATH1 22k array were subjected to hierarchical clustering across the Genevestigator V3 Arabidopsis anatomy database  as before to analyze their tissue specificity. Unique probe sets were found for all but one gene (AT5G24780). One cluster (a) contained 31 genes preferentially expressed in a similar fashion to SND2, namely in inflorescence nodes and stem, rosette stem and xylem, and silique (Figure 1). Another cluster of 13 genes (b) appeared to exhibit preferential expression in inflorescence stems and nodes, rosette stems, and occasionally seedling hypocotyls, root steles and anther-containing stamens, all of which contain SCWs to some degree. Thus, compared to the original SND2-OV(A) dataset, a much higher percentage (59%) of genes in the SND2∩Ko dataset displayed preferential expression in tissues containing SCWs. Combined with the AtGenExpress co-expression analysis, these data support the role of SND2 in SCW regulation and the validity of the SND2∩Ko dataset as the most likely direct or indirect targets of SND2. Absolute transcript abundance of SND2∩Ko genes represented on ATH1 22k arrays in Arabidopsis tissues and organs. Genevestigator V3  was used for microarray data mining, and the anatomical cluster analysis tool was used to visualize and cluster the genes according to their tissue-specific expression patterns. Tissues/organs are staggered hierarchically, and the number of arrays on which the data are based is indicated in parentheses. Absolute transcript values are expressed as a percentage of their expression potential (E.P. ), where E.P. is the mean of the top 1% of hybridization signals for a given probe set across all arrays. Cluster (a), highlighted in red, is comprised of 31 genes, including SND2 (*), which displayed preferential expression in tissues and organs where SND2 is expressed. Cluster (b) encompasses of 13 genes which displayed preferential expression in inflorescence stems and nodes, rosette stems, and in some cases the stamen, seedling hypocotyl and/or vasculature (stele) of roots. The microarray results were validated by RT-qPCR analysis. We profiled fifteen genes based on the microarray RNA isolated from stems of eight-week-old SND2-OV(A) and wild type plants (Figure 2). All RT-qPCR profiles agreed with the microarray data, and seven genes were significantly (P < 0.05) upregulated (including CesA4, EXPA15, FLA12 and MYB103). We also confirmed that the endogenous SND2 transcript showed no significant change in SND2-OV(A) stems, whereas total SND2 transcript abundance (the sum of transgenic and endogenous transcripts) in SND2-OV(A) stems was ~180-fold that of the wild type (not shown). We obtained similar results for selected genes from plants grown in an independent trial (Additional file 1, Figure S3). RT-qPCR analysis of selected genes differentially expressed in inflorescence stems of eight-week-old SND2-OV(A) and wild type plants. SND2-OV(A) plants were grown alongside the wild type in three biological replicate pairs, with primary stems from six plants pooled per sample. SND2-OV(A) transcript levels were normalized to the wild type in each replicate (assigned a value of 1, for each gene), hence error bars indicate the standard error of the deviation from wild type across biological replicates. Significance was evaluated by a one-tailed paired t-test, in accordance with the expected direction of response for each gene; *P < 0.05. We were interested in the temporal effect of inflorescence stem development on the putative targets of SND2 when constitutively expressed. We therefore performed a second microarray analysis of SND2-OV(A) and wild type plants at four weeks of age, sampling inflorescence stems that were ~120 mm tall. Of the 21 upregulated and 24 downregulated DEGs, no SND2∩Ko candidates were present, nor were any SCW biosynthesis-associated genes (Additional file 4). This result suggests that an additional co-regulator(s), only expressed after four weeks, is required for SND2 to function in fibre SCW regulation. Zhong et al. previously reported that SND2 overexpression significantly increased SCW thickness in interfascicular fibres (IFs) of Arabidopsis inflorescence stems. However, amongst our homozygous SND2-OV lines, scanning electron microscopy (SEM) revealed no significant changes in fibre wall thickness for lines A and B, whilst line C had significantly thinner SCWs than the wild type (Figure 3). These results were reproduced in an independent trial using light microscopy (Additional file 1, Figure S4). (i) SCW thickness in IFs of eight-week-old wild type and T4 homozygous SND2-OV lines A, B and C. Measurements are based on scanning electron micrographs. Error bars indicate the standard error of the mean of three biological replicates (21-42 fibres were measured per line). *Significantly different from wild type according to homoscedastic two-tailed Student's t-test (P < 0.02). 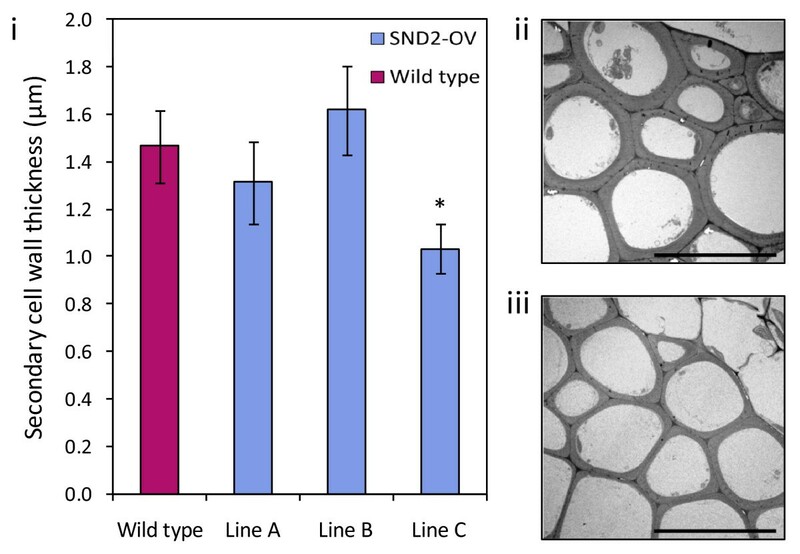 Transmission micrographs of representative IF regions of wild type and SND2-OV line C stems are shown in (ii) and (iii) respectively (scale bars = 20 μm). Fibre SCW thickness was additionally assessed in lower inflorescence stems of seven T1 SND2-OV and eight wild type plants using light microscopy. Representative micrographs are shown in Additional file 1, Figure S5. The T1 lines manifested a significant (21%, P < 0.02) decrease in mean IF SCW thickness (Figure 4A) that resembled SND2-OV line C and the SND2 dominant repression phenotype reported previously . Combined endogenous and transgenic SND2 transcript abundance from T1 plants exceeded that of the wild type plants by ~435-fold, ruling out co-suppression as an explanation for the phenotype (Figure 4B). Although no significant correlation could be found between SND2 transcript abundance and SCW thickness, our data confirm that strong SND2 overexpression reduces IF SCW thickness. Effect of SND2 overexpression on IF wall thickness in T1 generation stems. (A) Mean SCW thickness in IFs of eight-week-old wild type and T1 generation SND2-OV stems. Representative light microscopy images are shown in Additional file 1, Figure S5. Error bars indicate the standard error of the mean of eight wild type and seven T1 plants (26-48 fibres were measured per plant). *Significantly different from wild type based on homoscedastic two-tailed Student's t-test (P < 0.02). (B) Corresponding transcript abundance of total SND2 transcript in lower stems of six wild type and six SND2-OV T1 plants used for SCW measurements, as measured by RT-qPCR. The primer pair quantifies endogenous and transgenic SND2 transcript. Total SND2 transcript is ~435-fold relative to the wild type, represented here on a log10 scale. Calibrated Normalized Relative Quantity (CNRQ) values were obtained by normalization against three control genes. Error bars indicate the standard error of the mean of six plants. We hypothesized that SND2 overexpression could influence overall inflorescence stem biomass, irrespective of IF SCW thickness. The entire inflorescence stems of eight-week-old T4 SND2-OV lines A, B and C were weighed to determine total biomass yield. Only in the most highly overexpressing line, SND2-OV line C, was biomass significantly different from the wild type, where fresh and dry biomass was decreased (Additional file 1, Figure S6). This was despite the fact that all SND2-OV lines appeared phenotypically normal and exhibited no stunting or dwarfing (results not shown). Biomass profiles in Additional file 1, Figure S6 were in agreement with the IF SCW thickness profile for each respective line (Figure 3), suggesting a direct relationship between IF SCW thickness and biomass yield, and therefore a negative effect of excessive SND2 overexpression on biomass yield. The chemical composition of the inflorescence stems was investigated by Klason lignin analysis and quantification of monosaccharides following complete acid hydrolysis. SND2-OV(A) exhibited a nominal but statistically significant 2.5% relative decrease in total lignin (Table 3, P = 0.03). This was likely due to a reduction in insoluble lignin (Table 3). No changes were apparent in the relative abundance of glucose and xylose, and only mannose and rhamnose were significantly increased in line A (P < 0.05) by 7.4% and 5.4% respectively (Table 4). We also quantified the chemical composition of SND2-OV line C to investigate SCW composition when fibre wall thickness was reduced. However, no change in lignin or monosaccharide content was detected against the wild type (not shown). Klason lignin content of SCW material of T4 SND2-OV(A) stems compared to the wild type control. Values are expressed as the mean of three biological replicates plus or minus the standard error of the mean. P-values are based on paired two-tailed Student's t-tests between SND2-OV(A) and the wild type. Monosaccharide composition of SCW material of T4 SND2-OV(A) stems compared to the wild type control. Values (mg/g dry weight) are expressed as the mean of three biological replicates plus or minus the standard error of the mean. P-values are based on paired two-tailed Student's t-tests between SND2-OV(A) and the wild type. Compared to herbaceous annuals such as Arabidopsis, woody perennials devote a larger proportion of carbon allocation to xylem formation. We therefore examined the effect of Arabidopsis SND2 overexpression on xylem fibre characteristics in Eucalyptus trees by Induced Somatic Sector Analysis . Stems were transformed with a pCAMBIA1305.1 construct (containing the β-glucuronidase or 'GUS' reporter gene) overexpressing SND2. Tree stems were harvested after 195-210 days, transgenic sectors were identified in the cross-sections via GUS reporter staining, and etched to delineate the transgenic sectors prior to SEM analysis (Additional file 1, Figure S7). Fibre dimensions were measured from SEM micrographs as a percentage change between eleven transgenic sectors and adjacent wild type sectors for the SND2-overexpressing gene construct, as well as nine empty vector control (EVC) sectors expressing only the GUS reporter. Fibre cell area (i.e. average fibre cross-section area) was significantly increased in SND2-OV sectors compared to EVC sectors (Table 5, P = 0.042), demonstrating that SND2 influences fibre development in Eucalyptus. Fibre cell wall area and lumen area, which comprise fibre cell area, were marginally increased in SND2-overexpressing sectors relative to EVC sectors, but the differences were not statistically significant for these individual parameters. However, since the increase in cell wall area in SND2-overexpressing sectors was close to significant (P = 0.066), it is reasonable to suggest that the increase in fibre cell area was mainly due to a cell wall area increase rather than a lumen area contribution. Measurement of fibre cell area in the Arabidopsis T4 and T1 SND2-OV lines revealed no significant differences relative to the wild type (not shown). Change in fibre SCW thickness, cell wall area, fibre cell area and lumen area of Eucalyptus sectors overexpressing Arabidopsis SND2. SND2-overexpressing (SND2-OV) and empty vector control (EVC) sector values are expressed as a percentage change relative to non-transformed tissues. Measurements were obtained from 11 (SND2-OV) and 9 (EVC) transgenic-nontransgenic control sector pairs from two F1 Eucalyptus hybrids. P values are based on one-tailed Student's t-test. A role for SND2 in regulating Arabidopsis fibre SCW formation was previously suggested by studies establishing it as an indirect target of SND1, a master regulator of fibre SCW development [18, 20–22, 28]. In promoter transactivation experiments, SND2 was implicated in the regulation of cellulose (CesA8), but a role in regulating hemicellulose or lignin biosynthesis seemed unlikely . A particularly interesting finding was a fibre cell-specific increase in SCW thickness when SND2 was constitutively overexpressed, mirrored by decreased fibre SCW thickness in dominant repression lines . The proposed role of SND2 in Arabidopsis fibre SCW formation has not been independently validated and the full suite of genes regulated by SND2 has not been elucidated. To address this, we performed microarray analysis on a homozygous SND2 overexpressing line, SND2-OV(A), which also exhibited significant upregulation of the CesA8 gene. TFs have been shown to activate novel targets when ectopically expressed. A striking example was described by Bennett et al. for NAC TFs regulating primary cell wall modification in the root cap. Overexpression in stems caused ectopic lignification and ectopic expression of SCW genes . Our microarray results therefore likely include direct and indirect targets of SND2, as well as genes misregulated due to the ectopic overexpression of SND2. To discriminate native targets of SND2, we defined a subset of genes (SND2∩Ko) regulated by SND1  that were also found to be differentially expressed in this study (Table 1). We reasoned that obtaining the SND1 subset of targets would be a robust approach for reducing ectopic noise, because SND2 is indirectly, but strongly activated by SND1 [21, 28] and native SND2 targets should therefore be a subset of the SND1 targets. Further support for defining these seventy five genes as putative SND2 targets was provided by the finding that a large proportion (71%) of genes co-regulated (R > 0.9) with SND2 in a large compendium of AtGenExpress microarray experiments were included in the SND2∩Ko set (Table 2). Recently, Zhong et al. demonstrated transactivation of poplar CesA4, CesA8, GT43 and GT47 family gene promoters by a poplar co-ortholog of SND2, providing a third line of evidence that SND2 regulates SCW-associated genes. The SND2∩Ko set (Table 1) prominently included genes involved in SCW biosynthesis, transcriptional regulation and signalling. Amongst the SCW-associated genes, CesA4, CesA7 and CesA8 are involved in SCW cellulose biosynthesis [44–46]. COBL4 and its orthologs also appear to be involved in SCW cellulose formation [47, 48], and recently a homolog of TRICHOME BIREFRINGENCE, TBL3 (AT5G01360), was shown to affect secondary cellulose deposition and possibly SCW structure through alterations in pectin methylesterification . PARVUS, IRX8 and IRX10 are required for xylan biosynthesis in SCWs [50–53]. IRX15 and IRX15L, encoding functionally redundant DUF579 proteins, were recently shown to be essential for normal xylan biosynthesis [54, 55], but only the former was upregulated in SND2-OV(A) stems (Table 1). PGSIP1 and UXS3 are co-expressed with xylan synthases, with good evidence supporting a xylan α-glucuronosyltransferase function for PGSIP1  and a UDP-xylose synthase function for UXS3 [57, 58]. As shown previously , SND2 did not activate the xylan-associated IRX9 gene in this study, nor did it activate lignin-associated 4CL1. LAC4 and LAC17 encode laccases, an enzyme group that has been linked to SCW lignin polymerization . LAC4 and LAC17 are regulated by lignin-specific TFs MYB58 and MYB63  and were also recently shown to affect lignification in Arabidopsis xylem, with LAC17 specifically implicated in G-lignin polymerization in IFs . Our results (Table 1) thus suggest an additional role for SND2 in the regulation of lignification distinct from that of monolignol biosynthesis. Several TFs were upregulated in the SND2∩Ko set (Table 1). ANAC019 regulates biotic and abiotic stress responses [62, 63]. AT4G17245 is a C3HC4 RING-type zinc finger gene of unknown function. However, at least one C3HC4 gene, AT1G72220, has been previously implicated in SCW formation . We observed upregulation of RAP2.6L, an ethylene response factor involved in shoot regeneration and abiotic stress response [64, 65]. The upregulation of SND1 and MYB103 in SND2(OV) plants was unexpected. SND1, a master activator of SCW biosynthesis in fibres [18, 20–22, 28], is expected to be upstream of SND2 in the transcriptional network. It also seems intuitive that SND2 acts downstream of MYB103, since SND2 is an indirect target of SND1, whilst MYB103 is a direct target of SND1 . A positive feedback loop may exist through which upregulation of SND2, or another TF (Table 1), promotes SND1 expression. Recently, a signal transduction pathway based on a mammalian signalling model was proposed for SCW biosynthesis in Arabidopsis and rice (Figure 4 in ). Differentially expressed genes in SND2∩Ko included those encoding the principal proteins of this machinery (Table 1), namely FLA11/FLA12, CTL2 (AT3G16920), an LRR kinase (AT1G08340), Rac (AT2G36570), IQ (IQD10, AT3G15050) and RIC (AT1G27380). CHITINASE-LIKE 2 (CTL2), which lacks chitinase or chitin-binding activity , might interact with FLA11/12 in a similar way to the interaction of mammalian chitinase-like protein SI-CLP with a fasciclin domain-containing transmembrane receptor, Stabilin-1 [56, 67]. Two additional kinases (AT1G09440 and AT1G56720, Table 1) could possibly be involved in this signalling cascade. Based on these findings, we propose a revised model for the role of SND2 in the transcriptional network underlying fibre SCW deposition (Figure 5). Under this model, SND2 directly or indirectly upregulates the genes associated with this signalling machinery. The nature of this regulatory relationship remains to be resolved. Proposed model of SND2-mediated SCW regulation in IFs. Solid lines indicate known direct protein-DNA interactions. Dashed lines indicate direct or indirect protein-DNA interactions. Master regulator SND1 is activated by a signal transduction pathway proposed by Oikawa et al. (a). SND1 directly activates transcription of MYB103 and SND3 (b), and indirectly activates SND2 through an unknown intermediate (c; ). SND2 activates cellulose-synthesizing CesAs, either directly (d) or through the activation of MYB103 (e), which is known to activate SCW cellulose gene, CesA8 . SND2 regulates hemicellulosic genes (f; Table 1), independently to a similar role played by direct SND1 targets MYB46, MYB83 or C3H14 [76–78]. SND2 plays a role in lignification through activation of lignin polymerization genes LAC4 and LAC17 (g; Table 1), but it does not regulate monolignol biosynthetic genes as is the case for MYB58, MYB63 and MYB85 (h) [21, 60]. SND2 activates transcription of GPI-anchored FLA11/FLA12, CTL2 and other components of the signal transduction pathway (i), which leads to upregulation of SND1 (a). Despite the upregulation of the associated biosynthetic genes, we did not observe corresponding relative increases in glucose (i.e. cellulose) or xylose (i.e. xylan) content per unit mass (Table 4). There may not be a direct relationship between CesA expression and cellulose content, as evidenced when SND1 is overexpressed . However, we found that mannose and rhamnose content of stems were significantly increased in SND2-OV(A) by 7.4% and 5.4%, respectively (Table 4). The increase in mannose could be explained by the upregulation of CslA9 (Table 1), since CSLA proteins encode β-mannan synthases [68, 69]. Rhamnose and mannose were also reported to be increased due to SND1 overexpression . Although we found no effect on fibre SCW thickness in homozygous SND2-OV lines A and B, the fibre SCW thickness of line C was significantly and reproducibly decreased relative to wild type (Figure 3; Additional file 1, Figure S4). Because line C exhibited the highest SND2 transcript abundance amongst the homozygous lines (Additional file 1, Figure S1), we confirmed using several T1 SND2-overexpressing lines, with SND2 transcript far exceeding that of SND2-OV(A), that strong SND2 overexpression reduces fibre SCW thickness (Figure 4). This phenotype resembles the dominant repression phenotype of SND2, rather than the overexpression phenotype, reported previously . However, due to the stable expression of SND2 transcript in all transgenic lines (Additional file 1, Figure S1; Figure 4), this cannot be explained by co-suppression. Interestingly, a similar paradox has been observed for SND1 overexpression [20, 28], where excess levels of this transcriptional activator were reported to have an indirect repressive effect. We suggest that this phenomenon could be attributed to gene dosage effects, where a stoichiometric increase in one TF protein leads to a decreased molar yield of a multi-protein complex, and greater yield of incomplete intermediates (reviewed by Birchler et al. ). Such a phenomenon could also explain the observation that CesA8 upregulation was restricted to the most moderate SND2-overexpressing line, SND2-OV(A). Notably, the transgenic lines in our study expressed SND2 at least an order of magnitude greater than the ~16-fold expression levels reported for lines with increased fibre wall thickness by Zhong et al. . This is likely due to a double, rather than a single, CaMV 35S promoter in the pMDC32 vector driving SND2 overexpression in this study. Because we failed to identify SND2-OV lines with SND2 abundance near the range of 16-fold, we cannot preclude that limited SND2 overexpression may increase fibre SCW thickness. 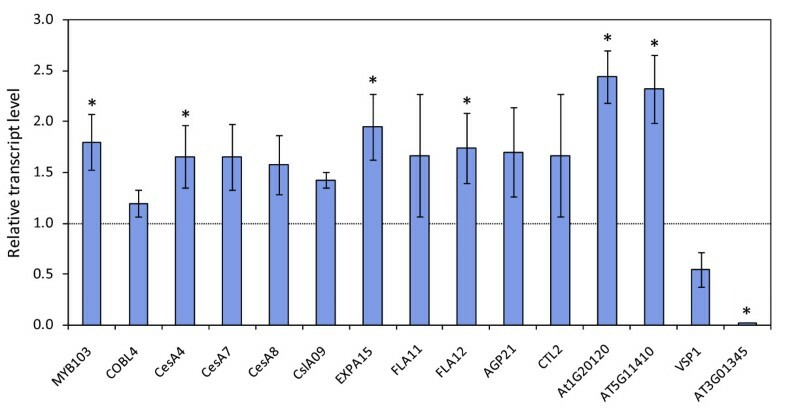 Interestingly, when we overexpressed Arabidopsis SND2 in Eucalyptus xylem (Table 5), we observed a phenotype in better agreement with that previously reported for Arabidopsis . SND2 overexpression in Eucalyptus significantly increased fibre cell area, likely due to increased cell wall area (Table 5). Because our assessment of SND2 overexpression in multiple independent events in both Arabidopsis and Eucalyptus contrast not only with each other but also with that of Zhong et al. , our results suggest that the phenotypic effects of SND2 gain-of-function mutagenesis are intrinsically variable. The positive effect of SND2 overexpression on Eucalyptus fibre development could be the result of a greater tolerance in Eucalyptus to high-abundance SND2 and/or SND2 co-regulator levels in woody xylem, since more carbon is allocated to SCW biosynthesis in Eucalyptus than in Arabidopsis. Alternatively, SND2 transcript levels remained moderate in Eucalyptus, a possibility that cannot be explored using the Induced Somatic Sector Analysis technique. In addition to the requirement of the appropriate level of SND2 abundance in Arabidopsis, spatial and temporal expression of a co-regulator(s) is a further requirement. The fibre-restricted SCW phenotype of SND2 overexpression observed in Arabidopsis by Zhong et al. illustrates the requirement of a spatially regulated co-regulator(s) for SND2 to activate its targets, which is presumably also expressed in fibres. Our results support this observation. Due to the fact that none of the genes differentially expressed at eight weeks (Table 1) were differentially expressed in four week stems (Additional file 4), we further suggest that the co-regulator(s) is temporally regulated, and that the temporal regulation of the co-regulator(s) may be a limiting factor that constrains the ability of SND2 to activate its native target genes at four weeks. Our results suggest that SND2 regulates genes involved in cellulose, mannan, and xylan biosynthesis, cell wall modification, and lignin polymerization, but not monolignol biosynthesis. SND2 also promotes upregulation of a relatively small number of TFs, amongst them MYB103 and SND1. We implicate SND2 in the unexpected regulation of the machinery of a signal transduction pathway proposed for SCW development  and propose a model in which SND2 occupies a subordinate but central position in the transcriptional regulatory network (Figure 5), with possible indirect positive feedback to higher regulators and signalling pathways. Our data support the role of SND2 in fibre SCW transcriptional regulation, but our study suggests that, at excessive levels of overexpression, SND2 has a negative effect on IF SCW deposition. This phenomenon requires further investigation. We postulate that SND2 overexpression could increase SCW deposition within a limited range of overexpression, relying in part on the abundance of additional regulator proteins. However, we show that SND2 overexpression has the potential to enhance fibre development in Eucalyptus trees, an important commercial forestry crop. Arabidopsis thaliana Columbia (Col-0) plants were grown in peat moss bags (Jiffy Products International AS, Norway) under a 16 h day artificial light regime, at ~22°C and ~75% humidity with weekly fertilization. Where applicable, hygromycin selection was performed for ~14 days before transferral of seedlings to peat moss bags. The stated age of the plants is inclusive of the hygromycin selection period. The coding sequence of SND2 (AT4G28500) was amplified (forward primer, 5'-ATGACTTGGTGCAATGACCGTAG-3', reverse primer 5'-TTAAGGGATAAAAGGTTGAGAGTCAT-3') from Arabidopsis thaliana Col-0 inflorescence stem cDNA. The amplicon was gel-purified with the MinElute Gel Extraction Kit (Qiagen, Valencia, CA) and cloned into pCR8/GW/TOPO as per the manufacturer's instructions (Invitrogen, Carlsbad, CA). The sequenced insert was transferred to pMDC32 and pCAMBIA1305.1  using the Gateway LR Clonase™ II Enzyme Mix (Invitrogen). The construct was introduced into Agrobacterium tumefaciens strains LBA4404 and AGL1 for pMDC32 and pCAMBIA1305.1 constructs, respectively, followed by Agrobacterium-mediated transformation of Arabidopsis thaliana Col-0. After surface sterilization, transgenic seed was selected on 0.8% agar containing 20 μg/ml Hygromycin B. The seeds were artificially stratified at 4°C for 2-4 days prior to germination at 22°C under artificial illumination. For the eight-week experiment, T4 seedlings were selected on hygromycin for two weeks and grown in peat moss bags for six weeks. For the four week experiment, no selection was employed; homozygous T4 seeds were germinated directly on peat moss. Each of three biological replicates consisted of ten or six plants in the four and eight week experiments, respectively. Stem tissues were collected on the same day between 08:30 and 11:00, flash-frozen in liquid nitrogen and stored at -80°C. Total RNA extracted from the bottom 100 mm of the primary inflorescence stems was treated with the RNase-free DNase Set (Qiagen) and genomic DNA contamination assessed by PCR using intron-spanning primers. RNA integrity was quantified using the Experion™ instrument (Bio-Rad Laboratories, Inc.). cDNA synthesis and cyanine dye coupling were performed as prescribed by the African Centre for Gene Technologies (ACGT) Microarray Facility (available at http://www.microarray.up.ac.za/MA008_indirect_labelling_version3.pdf). Microarray hybridization was performed using the Arabidopsis thaliana 4 × 44k DNA microarray V3 (Agilent Technologies, Santa Clara, CA), as described by the manufacturer's instructions, but substituting cRNA with cDNA. Dye-swaps were employed to correct for fluorophore bias. Slides were scanned using an Axon GenePix 4000B instrument (Axon Instruments, Foster City, CA, USA). Features were extracted using Axon GenePix Pro software (v6.0) and imported into limma (linear models for microarray data) . Data were normalized in R as described by Crampton et al. , with linear models based on the comparison between SND2-OV(A) and the wild type, analyzing each time point independently. Significant DEGs were defined as those with Pc-value < 0.05, where Pc is the False Discovery Rate. Raw data files of all the microarray experiments are available from the Gene Expression Omnibus http://www.ncbi.nlm.nih.gov/projects/geo/, under accession number GSE29693. Differentially expressed genes were subjected to an anatomical meta-analysis of expression in selected Arabidopsis tissues by hierarchical clustering (Pearson correlation) in the Genevestigator V3 public microarray database . Only high quality ATH1 22k arrays, and probe sets highly specific for a single gene, were selected for analysis. The quality of total RNA extracted from lower inflorescence stems was assessed by Experion™ analysis (Bio-Rad Laboratories, Hercules, CA). First-strand cDNA synthesis from genomic DNA-free RNA was performed using the Improm-II™ Reverse Transcriptase cDNA synthesis kit (Promega, Madison, WI) and cDNA purified using the RNeasy Mini Kit (Qiagen). RT-qPCR reactions were quantified using the LightCycler 480 system [45 cycles of 95°C denaturation (10s), 60°C annealing (10s) and 72°C extension (15s)] (Roche GmbH, Basel, Switzerland). Primer sequences that were used for each gene target are listed in Additional file 3, Table S2. LightCycler 480 Software v. 1.5.0. (Roche) was used for second derivative maximum value calculation and melting curve analysis. Statistical analysis was performed with Biogazelle qBasePLUS . For light microscopy, the lower ~5 mm of the primary inflorescence stem was fixed in formaldehyde/glutaraldehyde buffer (3.5% and 0.5% v/v, respectively) for up to five days and dehydrated in an ethanol series before embedding in LR White™ resin. Stem sections of 0.5 μm thickness were visualized with Toluidine Blue. Micrograph measurements were performed using ImageJ software (National Institutes of Health, http://rsbweb.nih.gov/ij/), using the polygon tool for cell area measurements. For SEM, 90 nm thick epoxy-embedded samples were imaged following sodium methoxide etching for 1 min  using a LEO 1455 VP-SEM instrument (Carl Zeiss, Germany) at 5 kV. Complete inflorescence stems from eight-week-old transgenic and wild type plants were stripped of siliques and cauline leaves and dried (100°C, 24 h). Stems from up to 24 plants were pooled for each of three biological replicates. Cell wall sugar and Klason lignin analysis were performed essentially as described by Coleman et al , using High Performance Liquid Chromatography (Dionex CarboPac PA1 4 × 250 mm) to determine carbohydrate concentrations. Triplicate technical repetitions were performed. ISSA was performed as described before  with some modifications. Eleven ramets of each of two hybrid clones, E. grandis x E. camaldulensis and E. camaldulensis x E. globulus, were selected in early summer on the basis of good form and growth for experimentation and ten 1 cm2 cambial windows were created on each plant. Agrobacterium tumefaciens AGL1 harbouring pCAMBIA1305.1 containing the Arabidopsis SND2 CDS and the β-glucuronidase or 'GUS' reporter gene was injected into the cambial windows. Plants were fertilised after inoculation and maintained in the glasshouse in the same condition as described previously  until harvest. After 195-210 days cambial windows were excised from the main stem, the phloem portion was removed and the remaining xylem tissue was washed twice with 0.1 M NaPO4 buffer (pH 7). Transgenic sectors were identified by GUS reporter staining. Eleven SND2-overexpressing and nine empty vector control sectors were analyzed. Transgenic sectors were excised in blocks of 1-3 mm3 (from the cambium to wound parenchyma) using a single edge razor blade, so that the sector was located close to the middle of the block when viewed on the longitudinal tangential plane. Blocks were then sliced transversely through the middle of the sector to expose the transverse surface of the sector, and then mounted with conductive adhesive on SEM stubs. Transgenic sectors were delineated within the block by etching the borders of the GUS reporter stain with a razor blade. Blocks were desiccated overnight prior to SEM imaging. Cell morphology measurements were undertaken using the Quanta Environmental Scanning Electron Microscope (FEI, Hillsboro, Oregon) to investigate changes in cell wall thickness, cell wall area (total amount of cell wall), cell area and lumen area. Images were taken of both transgenic sector and directly adjacent non-transgenic tissue, twenty to fifty cells from the cambial surface, using the low vacuum mode. Images were then analysed using freeware Image-J http://rsbweb.nih.gov/ij/ with ten fibres measured per micrograph. For the cell wall thickness, the mean of three measurements for each cell wall were used for cell wall thickness calculations, whilst for the remaining properties one value for each fibre was sufficient. Average values were calculated for each sector and their non-transgenic control tissues and converted into percentage change values. Percentage change values between SND2 overexpression sectors and empty vector control (EVC) were statistically assessed with the Student's t-test. We thank James Wesley-Smith of the University of Kwazulu-Natal Electron Microscopy Unit for conducting transmission and scanning electron microscopy, Nicky Olivier of the African Centre for Gene Technologies Microarray Facility at the University of Pretoria (UP) for assistance with data analysis, and L'zanne Jansen van Rensburg (UP) for assistance with cell wall chemistry analysis. Martin Ranik (UP) cloned the coding sequence of SND2 and transformed Arabidopsis thaliana. This work was funded by Sappi and Mondi through the Forest Molecular Genetics (FMG) Programme at the University of Pretoria and further supported by funding from The Human Resources for Industry Programme (THRIP) and the National Foundation for Research (NRF) of South Africa, as well as an Australian Research Council (ARC) Linkage Grant LP0668943 to the University of Melbourne. SGH conducted the experimental work and drafted the manuscript. EM, DKB and AAM assisted with the drafting of the manuscript, conceived of the project and aided in the design and supervision of the study. AVS and GB performed the induced somatic sector analysis experiments. All authors have reviewed and approved the manuscript.